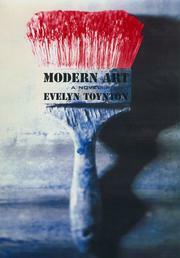 First-novelist Toynton casts a narrowed eye on the amoralities of the art market in this unsentimental but far-too-mechanical debut. Belle Prokoff is the long-suffering widow of reckless genius Clay Madden (read Lee Krasner/Jackson Pollock), and as she declines into painfully arthritic old age, she knows all too well that any attention given to her own paintings probably masks (if barely) a museum's or gallery's or collector's real interest, which are the Madden paintings she still retains. Still another species of parasite crawls onto the scene when a schlocky biographer shows up looking for whatever scandalous gossip he can find about the old days to juice up his book. Lizzie, a young grad student pressed into service as Belle’s assistant/nurse out in the Hamptons, seems the only selfless soul in the vicinity—and yet behind even her creeps self-interest in the form of a frustrated painter boyfriend. He'd not only like to be inspired by the Madden house and studio, he also knows he might get into a tony gallery's group show if he can just locate the legendary Maddens secreted by Belle all these years.To the widow, of course, the Madden paintings are “her ghosts, her totems. Nobody will ever earn them as she has, no matter how many millions change hands.” Earn them, that is, as the wages of abuse, neglect, and the torpedoing of her own career. With so much villainy stuck in globs upon her palette, Toynton can’t help herself: using words like “lizard” and “corrupt,” she draws caricatures more than characters. A slyer, less direct, and more satirical touch was probably called for (think what Dawn Powell did with similar material in A Time to Be Born). Still, even a stiff and fuming novel like this one serves as a reminder that artistic reputations have always been commodities traded on an exchange.